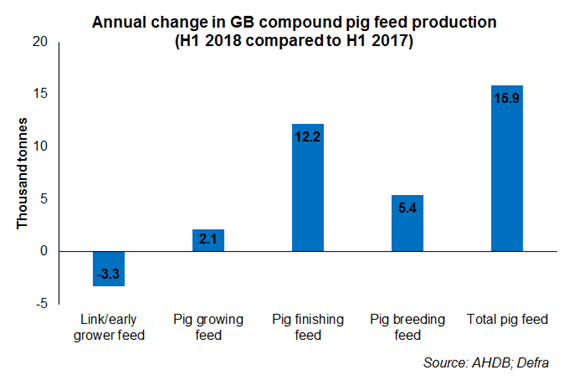 Conversely, link/early grower pig feed production has decreased by 6.5% year-on-year to 47,800 tonnes during the first half of 2018. Anecdotal reports suggest post-weaning mortality was higher during winter 2017/18, which may have influenced this decline. For starter/creep feed production, data for January 2018 was not published due to an insufficient sample to produce a robust figure. Nonetheless, data from February – June 2018 shows that starter/creep feed production has declined by 2.2% on year earlier levels, to 22,700 tonnes. With growth in UK pig meat production expected to continue for the rest of the year GB compound pig feed production may also remain firm. However, this is dependent on a number of factors including, but not inclusive to, feed conversion and weather during the autumn/winter.